What is arguably Agatha Christie's most famous tale returns to the big screen once again, helmed by director and star Kenneth Branagh, with some stylish modern production values and an undeniably impressive cast. The core story remains largely unchanged - the greatest detective of all time Hercule Poirot (Branagh) finds himself forced to resolve the unprecedented killing on the luxurious Orient Express. The suspect is left amongst the many passengers, forcing Poirot to locate the culprit before they can strike again. Once again this latest adaptation of Christie's renowned novel doesn't take many liberties with the main plot - such a treasured tale perhaps shouldn't be excessively toyed with, though this will undeniably be a slight downside to some as it leaves little room for surprises. The tension is generally well handled and the revelations as the plot moves forward fairly exciting and enjoyable, though what's a shame is perhaps the inconsistent pacing which can affect the atmosphere the story holds as it begins to unfold toward it's more climactic moments. Some segments also feel undeniably quite boring, making you think the runtime they eat up could've been used toward scenes that are a bit more engaging and influential to the overall plot. But now I'm making the film seem like a real downer - Orient Express is still an entertaining thriller, supported once again by some rich production values and an undeniably stellar cast, even if some of the more talented members feel slightly underused at times. The cinematography, lighting, set design, it's all beautiful to look at and captures the time period as well as the atmosphere perfectly; this is especially apparent during the film's more eerie moments. The obvious CGI shots of the train racing along the rails during rough terrains do feel a little phoned in, however - of course computer imagery is the main way such shots would be done, though the abruptly epic presentation and thunderous sound design can make them contrast oddly with the rest of the film. Branagh delivers a superb performance as the lead detective Poirot, capturing the character's witty sense of humour and balancing it nicely with his more serious side when delving into the depths of this sinister crime. The rest of the cast, while not as consistent, also perform strongly - Josh Gad, Willem Dafoe, Derek Jacobi, Penélope Cruz, as well as Johnny Depp as the murder victim himself. Depp's role is of course not very lengthy considering his early sign off, but the performance he does deliver is solid enough for what the character is. What weakens much of the effort provided by this fab cast is the lack of development toward the characters they play - even Poirot himself doesn't feel as interesting as you might wish he was despite Branagh's polished performance, and this flaw is even more applicable for some of the supporting roles. 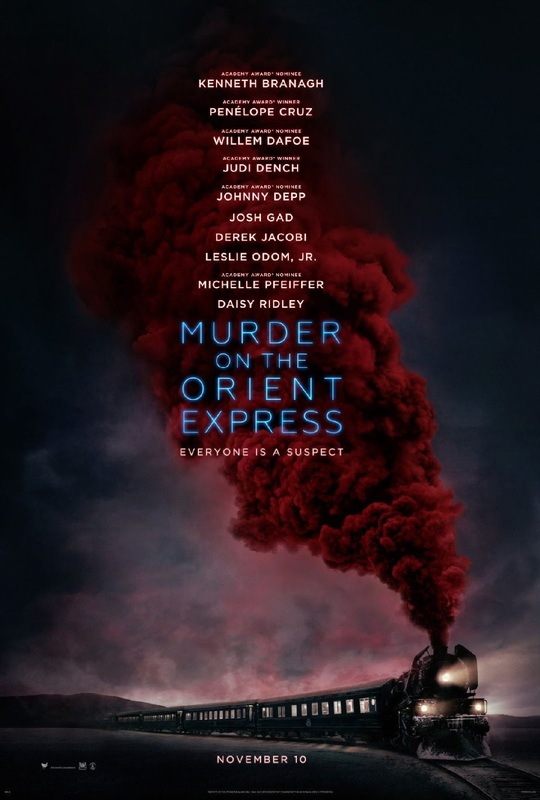 Murder on the Orient Express delivers tender emotions alongside some engrossing thrills, all presented with some lovely aesthetic design; and while it's plot development and pacing is not as refined, the end product is an entertaining adaptation of the renowned mystery.